Why should we eat pomelo fruit? Ketogenic diet menu for easy weight loss health Why should we eat pomelo fruit? What is a pomelo fruit and how to eat it? Pomelo fruit, Latin name Citrus maxima or Citrus grandis is an unusual and an interesting family member of southern fruits which by no means you should not ignore. Looking at the size of these fruits, we can say that this is the biggest one of all citruses. At first glance it will seem to you that it is a hybrid of grapefruit, but actually it is a special type. The flavour is what sets it apart from its cousins ​​that we just mentioned. It is sweet, not too tart and has a firm thick crust. Lately, it became a real hit in the world, which is available in all major stores. We are happy to say more about what the pomelo fruit is, how to eat it, what are the health benefits, and for gourmets we have prepared interesting recipes. How to cultivate the biggest citrus fruit? Pomelo is one of the citrus fruits, and originates from the far South East Asia. Therefore, it is also known as Thai pomelo, and the fruits may be red, white and pink. In Chinese culture, it is a symbol of prosperity and happiness, but often it is in a menu of local cuisine, and is a mandatory part of many traditional dishes. What makes its fruits characteristic is their size. It can weigh to even five kilograms which is at least fascinating and many who see it for the first time are amazed. Although pomelo fruit is growing in exotic places, it is widely exported around the world. It can be crossed with mandarin and lemon, and you can do it yourself in your backyard or even at your own home, if you meet the conditions. It favours sunny places for most of the day. Pomelo seedlings provide fruits only after 8 years, and therefore you need a lot of patience and attention to greet the first generation of these large and interesting citrus fruits. What is the composition and nutritional value of pomelo? The reason that this fruit has become so popular is that it has a very rich nutritional value. It contains vitamins C, A, B1, B2 and B12, and the minerals containing valuable potassium. Besides it present are calcium, iron, copper, phosphorus, magnesium and zinc. However, what will most interest those who want to lose weight is whether pomelo contains any calories. The great advantage of this citrus is that at 100 grams it has only 37 calories, so it is definitely recommended to those who want to lose weight in a healthy way. A big plus is given to dietary fibre which is abundant in his flesh. Therefore, you will surely love this delicious piece of fruit and enjoy its juice. This is one of the few fruits rich in high concentrations of vitamin C. It is very useful and much needed to our body in order to protect it against a number of diseases, but the most important role it has is that it boosts immunity. You probably know how healthy and beneficial lemon is, but you will love it when we say that pomelo fruit contains vitamin C in far greater quantities than any other citrus. In fact, 190 grams of fruit contains even 193 percent of the daily requirement, which puts him in the top of the list of healthy foods. This citrus fruit is very beneficial for our body, it therefore certainly needs to be included in your list of ingredients. It should be noted that for those who love sweet taste it is recommended to buy red and pink pomelo, and those who like a little tart flavour can taste white fruits of citrus. 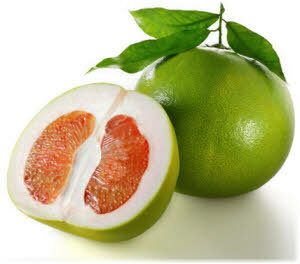 Love will come at first bite, it will certainly further motivate you and here is the list of the following facts for what is pomelo fruit good for. Continuous consumption of citrus fruit can be of great benefit to those who are looking for a natural remedy for urinary tract infections. Vitamin C, which is the main asset of this fruit kills bacteria that cause diseases of the bladder, kidney and urinary tract. It increases the level of acid in the urine, prevents microbes and microorganisms and promotes the removal of pain and symptoms of inflammation. It is known that grapefruit contains potassium in larger quantities than, say, bananas. This element is a natural ally of the heart and blood vessels and it should be taken daily in the body. Citrus fruit pomelo contains potassium also in high concentrations, and we are advised to drink its juice. It helps to reduce bad cholesterol in the blood and eliminate the deposits from the walls of the arteries. Therefore, pomelo juice can be of great help when reducing the risk of stroke and heart attack. Free radicals and various toxins that accumulate in the body represent a big risk. It is known that they are one of the most common causes of the generation of infections and inflammatory processes. This citrus fruit prevents all harmful substances that attack your organs by stimulating the production of antibodies. In addition, pomelo fruit will help to strengthen the immune system and to easily defend against colds, flu, and asthma and numerous allergies. This fruit contains dietary fibres which are very useful when it comes to proper functioning of the intestines. It is recommended for people suffering from the symptoms of constipation, as well as those who want to prevent diarrhoea. It is very useful to eat pomelo fruit by those to whom it is a priority to lose weight because it encourages digestion and regulates bowel through the elimination of harmful substances. The bark of this fruit is rich in bioflavonoids, antioxidants that prevent malignant bowel diseases and pancreas, as well as breast cancer. Regulate estrogen levels and therefore helps those who are already suffering from the cancer. Since it contains high amounts of fibre, pomelo protects the body against colon cancer more than any other similar foods. Vitamin C is essential for the regulation of collagen, which is essential when it comes to the strengthening of tissues, organs and cells. It is important for dental health because it prevents infection of the oral cavity. In addition, it is useful to consume pomelo fruit for teeth because it prevents bleeding gums. Regular consumption of citrus fruits reduces the accumulation of melanin in the skin pores, which prevents the appearance of spots, and eliminates the stains on the face. In addition, pomelo fruit is great when the acne and pimple are in question, because they normalize the production of sebum. This is certainly great news for those looking for a natural alternative to expensive creams and ointments. Vitamin A is of a great benefit to the skin, and since this fruit is rich in it, it will surely delight you with the fact that it has an outstanding performance in reducing wrinkles. Pomelo stimulates collagen deposition in the cells and slows the breakdown of elastin. Therefore it is considered natural fighter against aging and enables your face to be tight, with no dark circles and wrinkles. It is known how much UV rays damage our skin and we have to be careful during the summer months as we protect ourselves from it. Pomelo fruit is a natural guard against harmful solar radiation, because it stimulates the regeneration of cells of the epidermis. In addition, a combination of enzymes in these fruits strengthens the resistance of the skin to UV rays, but also it allows its faster recovery if it happens that you have a sunburn. If you liked this citrus fruit, you will love it more when you find out that it is a food that is very beneficial and helpful for your hair. Since it contains vitamins A, C and B1, which in combination with zinc makes miracles for the hair. With slightly smaller amounts of sulphur, calcium and iron, this fruit helps stimulate hair growth and the elimination of excess fat from the surface of the scalp. The right solution for those who want to avoid costly and inefficient chemical preparations! Hydration of the skin is very important to avoid its drying and flaking but it is especially important to pay attention to the epidermis of the scalp. It is the most sensitive and susceptible to dandruff when the body does not have enough water and necessary minerals. Pomelo for hair can be of great benefit, because it deeply hydrates the skin of the head. With the help of vitamin C it soothes irritation of the scalp and removes dandruff from the surface and prevent its re-emergence. Free radicals are very harmful to the hair follicles. Their negative impact is reflected in the weakening of the hair quality, it becomes thin and prone to breaking. The antioxidants in this fruit minimize the impact of toxins and free radicals, which gradually restores the quality of the hair. It becomes thicker, stronger, and brighter and begins to grow faster. For those who have such problems, the right solution is pomelo juice. Since it differs from other citruses, it is important to know how to eat pomelo fruit. The flesh of the fruit is made up of several parts, such as oranges and grapefruit. Among them are the membranes that have a bitter taste, but those who do not like this flavour should remove them. The flesh is sweet and you will enjoy every bite. Cut the upper part of the fruit, with a knife and gently seize the crust. At the same time, make sure that the "cap" is the only part of the crust, because you should not damage the inside of the fruit. Cut the skin with the few vertical lines, and about half an inch in depth. Drag slices to the outside so that the fruit is completely "open". You will see the inside which is a mild light pink colour. Remove the crust completely. Meat that is slightly smaller in size will remain, since the bark is thick this should not surprise you. Halve the fruit with hands. After that you can separate all the parts, like when you eat an orange. Remove the membrane from each part. This is recommended for those who do not like the bitter taste. Simply peel the fruit with your fingers and remove the membrane, because it is easily removed from the meat. Enjoy the taste and benefits of pomelo fruit. We will share with you the recipes for delicious dishes to which this food adds an additional charm. In a bowl pour the shrimp, pomelo fruit and mint leaves. Add chopped onions, hot peppers and ground peanuts. In a separate bowl prepare toppings with two tablespoons of fish sauce, the squeezed lemon juice and two tablespoons of brown sugar. In a pan heat the oil and add the shallots and chopped garlic. Fry until it takes on rosy colour, then remove from heat. Cover shrimps with sauce of lemon and add shallots and garlic. Preheat oven to 180 degrees. Grease a baking sheet and place the baking paper. In a larger bowl, add flour, baking powder and salt, and in the second insert the yogurt, sugar, eggs, oil and vanilla. Slowly add these ingredients to the flour and mix with a mixer on the lowest speed. When a uniform mass is created, pour it into a baking pan and put it to bake for about 45 minutes, or until you notice that it is done. Meanwhile, cook 1/3 cup of pomelo juice with a spoon of sugar. When you get a uniform dressing, allow it to cool slightly. Remove the cake from the oven and let it sit for about 10 minutes. After that, cover it with pomelo sauce so that the crust completely absorbs it. Allow it to cool completely and finally sprinkle it with powdered sugar. If desired, add a pomelo juice once again to the cake to make it softer and tastier. What is the price of pomelo citrus? When it comes to pomelo fruit the price is between 3-5 dollars for 1 kilogram. Bearing in mind that the fruits are large and can weigh up to 5 kg, we can say that it is a bit more expensive compared to oranges and grapefruit. However, this delicious fruit can be purchased at any supermarket, since it has become a real hit. We recommend that when buying you make sure the bark is green and there are no stains nor damage on it. Although it is a very healthy food, it is important to draw your attention to some precautions. Pomelo contains vitamin C in high amounts, and combined with potassium it can be harmful to people who have problems with the liver and kidneys. In addition, people with hypotension should moderately consume this fruit, because it lowers blood pressure. The side effects that can occur are sleepiness, mild dizziness, frequent urination and nausea. Therefore, it is important to consult with your doctor to make sure that you can enjoy pomelo fruit every day.